Alverton Cottage has direct access to the beach, and also has its own private space to sit and relax. The garden is shared. Beach chairs and chair pads are provided. There is a BBQ grill and a garden shower. The sitting room has windows and patio doors both looking directly over the Caribbean sea. The balcony with table and chairs also overlook the ocean only 12 feet away.The Cottage has a galley style kitchen with small breakfast area. It is fully equipped with essential appliances.The cottage is very cosy and has an old world charm. It also has a view of the most beautiful sunsets anyone could ask for and if you are coming to Barbados for sun, sea and relaxation the cottage is the ideal choice. 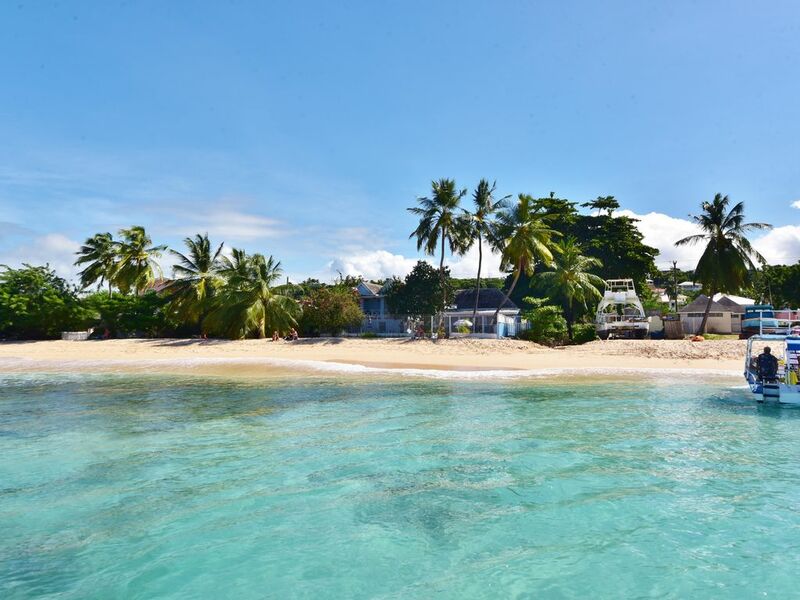 Alverton offers 2 & 3 bed beachfront villas, a studio apartment and a charming cottage all situated on a white sandy beach in Fitts Village, St James. All offer the most romantic & idyllic beachfront settings for the perfect vacation. The rental properties are self-catering with daily maid service. All offer air conditioning and fully equipped kitchens. In order to maintain our 2000 prices and increased energy costs, air conditioning is free of charge for the first 12 hours in a 24 hour period. In the vast majority of cases guests turn it off when they go out and incur no extra cost. A daily laundry service is available if required. They are very well situated for all local amenities. For anyone not wishing to hire a car, local transport is very frequent and inexpensive. Watersports operate all along the coastline and can easily be arranged. There is a supermarket one minute from the apartments in a complex which also has a doctors surgery and pharmacy if needed. All rentals offer the luxury & romance of being on the beach. Alverton offers comfortable, unpretentious, charming properties and regular guests have always returned home relaxed and happy. Choose Alverton for your beachside vacation rental - villa or cottage - for that perfect beachfront vacation. This is a family run business. Elaine my wife looks after Alverton and lives close by. She is on hand to assist in any matters. Shirley the maid has been with us over 15 years, she is a brilliant cook and can babysit if required. This you can arrange directly. Alverton The 2 & 3 Bedroom Villas are the closest properties to the water edge. Built on the beach with french doors opening onto the veranda, ideal for alfresco dining. Stunning views of the sunset and sunrise of the caribean. The veranda via the courtyard garden is 15 metres to the gate that opens directly onto the beach. Alverton The Cottage has a balcony which is 3 metres to the beach, with a coral stone decked area, ideal for alfresco dining. The Studio faces the beach road and has use of the courtyard garden. Situated on a white sandy beach that stretches for miles in either direction. It's ideal for all water sports or simply basking in the sunshine. The courtyard garden has a barbeque, shower and beach chairs and towels. It is also an ideal location to view the turtles hatching close by. Having saved up the pennies for a few years to celebrate my 60th birthday, I decided to take the family away for a good holiday, rather than spend it all on a night of boozing and dancing. I had wanted to go to Barbados for some years and looked for a place that we could call our own. We selected Alverton Villas as we wanted somewhere close to the beach. Well, if you got any closer you would be on a boat! It is steps away from the sea and the beach is perfect. I cannot recommend this collection of villas highly enough to anyone looking for a perfect vacation getaway. We rented all the villas for a month and it was one of the best decisions I have ever made. They were all spotlessly clean and very comfortable. Elaine and Shirley looked after us so well they almost ended up with squatters. Shirley even cooked for us a few times while we were there, for a very reasonable agreed fee, to save us having to do it ourselves. Real Barbadian food! We often went swimming with the turtles that tend to frequent the sea outside the villas and with the crystal clear waters it was a real experience. We really did not want to leave and with any luck the wife and I will be going back next year. Visited in June 2016 for a 10 day stay. Beautiful west coast location in Fitts Village with local shops, friendly neighbours and great transport links. Delightful property with well proportioned living space and a large outdoor courtyard area and a parking space. Direct gated access onto the stunning white sandy beach and swimming with turtles and tropical fish just off the beach. Local car hire allowed for excursions around the whole island. Had an amazing time at the property and were so impressed that we are returning for a 2 week visit later this year. Highly recommended for all age groups of holiday makers. And we look forward to your next stay. Alverton Cottage and indeed the Villa and Studio are one the best self catering places to stay in Barbados. The location is perfect, right on one of the best beaches, close to shops, bars/restaurants, local transport and has ample parking. We stayed in the Cottage which is lovely - there was nothing better than sitting on the Veranda with a cold one and watching the world go by on the beach. Stepping through the gate onto the beach every morning was a real treat. One reviewer has said there are stones in the water - yes there are but there is also a very wide sandy inlet right outside the cottage that takes to to as deep as you want to go - we didn't have any problems. The owners, Michael and Elaine and lovely people and will made sure we had a great time - you will too. We've already booked for March 2017 and can't wait. Alverton Cottage is quite idyllic, we love it! With very comfortable accommodation it is well equipped (including good wifi) and is sited so close to the beach such that you can sit on the balcony and hear the waves lapping the shore at night and watch the setting sun and passing cruise ships in the distance. During the day the beach and Fitts Village with its small supermarket is peaceful and relaxing with none of the hubbub of those all-inclusive resorts but with easy access to Holetown or the rest of the island by bus or car. For a couple or young family we highly recommend the Alverton Cottage. My wife and I have booked again for 2017 (our 5th visit), I think that says it's all! This was an ideal location for us - the veranda provided shade for my husband and the garden full sun for me. We watched turtles swim in the clear blue sea whilst dining on the veranda and I was actually privileged to swim with one. The beds are comfortable, bathroom adequate and the kitchen well equipt. Elaine and Shirley are always available to see to your needs (although these will be few - what else will you need when the sea is at your doorstep). Jordan's supermarket is just across the road for any provisions and a Waitrose type supermarket a 10 minute bus ride way. Thanks Jill for your valuable input and we look forward to your return next year. Alverton Apartments are situated on a white sandy beach in Fitts Village, St James and are very well situated for all local amenities. For anyone not wishing to hire a car, local transport is very frequent and inexpensive. Watersports operate all along the coastline and can easily be arranged. There is a supermarket one minute from the apartments in a complex which also has a doctors surgery and pharmacy if needed. Holetown is situated 2 miles north of Alverton and this very vibrant pretty town has many popular restaurants and good shopping facilities. The town has a very long history being the site where the first settlers landed and the town has grown over the years to be a very popular destination for tourists and locals alike. Bridgetown is 3 miles south of Alverton and has a large number of shopping areas and is worth the visit just to browse and soak in the history of this very old Caribbean city. Speightstown, a charming old Bajan town, is 7 miles north of Alverton. RATES UNCHANGED FOR OVER 10 YEARS - THAT'S RIGHT ....NO INCREASE SINCE 2000 !!! Additional days charged pro-rata. Maid can prepare meals upon request. Babysitting service also available. Credit cards accepted. Car Hire and Water Sports can be arranged if required. Extra Beds (Single) £60 per week. Childs Cot £25 per week. Childs High Chair Free of Charge.